^ a b Neas, John F. "Development of the Integumentary System". In Martini, Frederic H.; Timmons, Michael J.; Tallitsch, Bob. Embryology Atlas (4th ed.). Benjamin Cumings. Archived from the original on |archive-url= requires |archive-date= (help). ^ a b c d Draelos, Zoe Diana (2010). "Prevention of Cosmetic Problems". In Norman, R. A. Preventitive Dermatology. Springer. p. 182. doi:10.1007/978-1-84996-021-2_16. ISBN 9781849960267. ^ Martin, J. J. (31 January 1984). "Neuropathological Diagnostic Methods". In Neetens, A.; Lowenthal, A.; Martin, J. J. Visual System in Myelin Disorders. The Netherlands: Springer. p. 367. ISBN 9789061938071. Kurosumi, Kazumasa; Shibasaki, Susumu; Ito, Toshiho (1984). 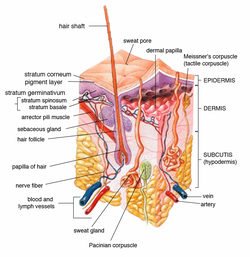 "Cytology of the Secretion in Mammalian Sweat Glands". 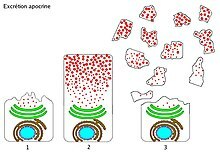 In Bourne, Geoffrey H.; Danielli, James F. Protein Diffusion in Cell Membranes: Some Biological Implications. Orlando, Florida: Academic Press. pp. 253–330. ISBN 9780123644879. Tsai, Ren-Yu (1 January 2006). "Treatment of Excessive Axillary Sweat Syndrome (Hyperhidrosis, Osmidrosis, Bromhidrosis) with Liposuction". In Shiffman, Melvin A.; Di Giuseppe, Alberto. Liposuction: Non-Cosmetic Applications. Germany: Springer. pp. 496–497. ISBN 9783540280439.